March is that time of year that we approach the end of one Tax Year and the start of the next, and the National Minimum Wage and Living Wage increases. This is important for everyone in the equine industry – employers and employees alike. Equestrianism is a notoriously low-pay industry in terms of hourly salary, and salaries are frequently, if not always, topped up with extras, bonuses and tidbits. But in reality, how lawful are we in doing this without the advice and guidance of accountants and tax specialists? And what are the consequences of getting it wrong? The UK Government has strict laws regarding the minimum sum of money any individual can receive in return for work done and it can be confusing at least, a minefield at worst, when remunerating staff not just fairly, but legally too. 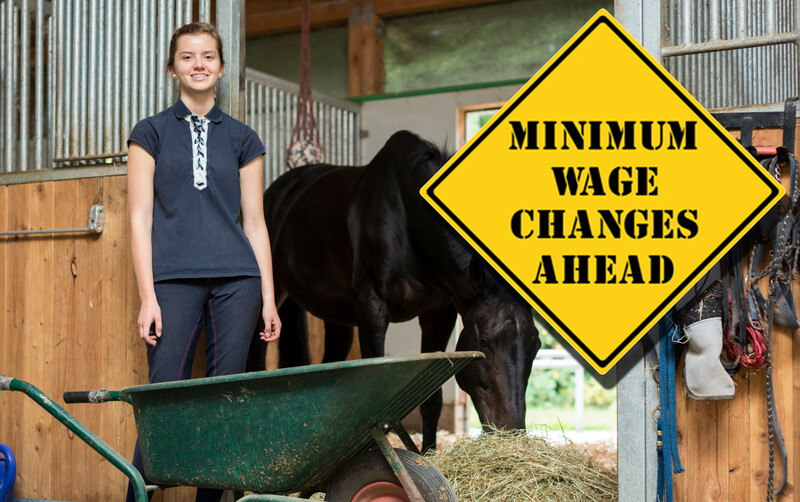 In this article we give answers to basic questions for both employers and employees regarding the National Minimum Wage and Living Wage and to highlight common misconceptions within the equine industry regarding wages, remuneration packages and the law. The content provided in this article is for informational purposes only. We kindly remind readers that it is the responsibility of the individual to ensure that the information they are working to is correct and appropriate for their specific circumstances. Always consult a qualified professional in times of doubt. What is the National Minimum Wage and Living Wage? The National Minimum Wage (NMW) and the National Living Wage (NLW) is the minimum wage per hour a worker is entitled to in the United Kingdom. These rates are set out into age bands, from Apprentices through to experienced adults. The wages are reviewed yearly by the government and are advised by the independent body Low Pay Commission (LPC). These rates are not guidelines, they are the law, and there are few exceptions to employees who are entitled to these hourly rates. What are the new National Minimum Wage and Living Wage hourly rates? From what date does the new National Minimum Wage and Living Wage apply? The new National Minimum Wage and National Living Wage rates come into force from the 1st April 2019. All employees must be paid at least the new, increased wage rate regardless of how long they have been in their job. Who is entitled to receive the National Minimum Wage and Living Wage? school leaving age (last Friday in June of the school year they turn 16) to get the National Minimum Wage. aged 25 or older to get the National Living Wage – the minimum wage will still apply for workers aged 24 and under. Contracts for payments below the minimum wage are not legally binding, the worker is still entitled to the National Minimum Wage or National Living Wage regardless of any existing employment contract. Freelance Grooms offering services to horse owners are not employed workers but service providers, therefore do not qualify for the National Minimum Wage and Living Wage. Freelance Grooms will set their own hourly rate. Employees with accommodation – do I still need to pay/receive the National Minimum Wage and Living Wage? Yes, but an employer is entitled to deduct a set daily/weekly amount from the National Minimum Wage and National Living Wage rates. We have covered in some detail the law regarding the National Minimum Wage and jobs with accommodation here. Employer or employee, if it applies to you, do have a read. Employees on an excellent salary package with plenty of extras – do I still need to pay/receive the National Minimum Wage and Living Wage on top? Yes. The Government is quite clear on what can be deducted from the National Minimum Wage and National Living Wage – only the accommodation offset rate can be deducted from the National Minimum Wage and Living Wage. Bills, extras (wifi, Sky/Satellite/Cable TV, cleaning etc), livery fees/cost of a horse, training/lessons can be charged to the employee, but not deducted from the National Minimum Wage. The employee must receive at least the National Minimum Wage and pay any charges to the employer in a separate transaction. A “payment in kind” arrangement is acceptable as long as it does not take a wage below the National Minimum Wage and, either way, any extras thrown into a salary package must still be declared to HMRC. What happens if I don’t pay/receive the National Minimum Wage and Living Wage? The Government takes the National Minumum Wage and National Living Wage increasingly seriously, so much so that they have recently named and shamed almost 180 employers in the UK for underpaying their employees. The employers were also fined £1.3m collectively, on top of collectively paying out £1.1m in backpay for 9200 workers. The Government are on it, and it really isn’t worth risking the consequences! In the eyes of the law, the National Minimum Wage is not only the employer’s responsibility – an employee mustn’t accept less than the National Minimum Wage for their age. To work out if you are receiving the correct wage for your age you can use this handy National Minimum Wage and Living Wage calculator from the Government website: National Minimum Wage and Living Wage Calculator. 1. Review, negotiate and agree on a wage or salary package – regularly! For both employers and employees, the subject of paying and receiving money can be an uncomfortable one to raise, but it really is important that you take this bull by the horns and keep yourself safely within the law. Get over any reluctance to broach the matter, and don’t be afraid to negotiate a fair and legal wage, or salary package, not only at the start of employment but regularly throughout. Age: Over time, employers must be aware of their employee’s age and make sure their wage is increased to reflect the appropriate age band. Employees mustn’t be afraid to remind an employer that their birthday is approaching. It’s not about being cheeky or greedy, it’s about being lawful. Changes in circumstances: Remember to review and adjust wages at times of change. If an employee moves from staff accommodation to live out locally it is imperative that their wage is reviewed and adjusted regarding the removal of any accommodation offset rate applied. This could be easy to forget and would lead to a breach of National Minimum Wage and Living Wage laws. If you are an employer or employee engaging in like-for-like arrangements, for example, the employee receives riding lessons, livery, the provision of a car or use of the lorry as part of a salary package, scrutinise this carefully – HRMC certainly would. It is perfectly acceptable to offer free products and services as part of a salary package, providing the employee receives the National Minimum Wage or Living Wage in addition to this, and additional benefits and bonuses are reported to HRMC appropriately. There are certain circumstances when deductions take a wage below the National Minimum Wage and Living Wage, and you must know when it is legal and when it isn’t. For example, livery for a staff horse cannot be deducted from the National Minimum Wage and Living Wage, and it is illegal to do so. If an employee must pay a fee for an extra such as this, the employee must be paid at least the National Minimum Wage and Living Wage and be charged separately for their horse. Learn more about making deductions here. To be honest, in the equestrian industry it’s a common mistake to work out a groom’s salary against standard office hours which, as any seasoned equestrian will know, is highly unlikely to be the case! An employer can choose to pay for a lunch hour or not and, either way, this needs to be clearly stated in the contract of employment. If an employee’s working day is 7am-8.30am, 9am-1pm, 2pm-5.30pm, for any number of days in a week, they must be paid for each of those hours! Paying someone who has worked 9 hours or more for 6 days a week the National Minimum Wage for a 9am-5pm Monday-Friday does not count as a legal wage! Also, any overtime must be paid hourly on top of the standard daily salary. Be realistic when paying/receiving the National Minimum Wage and Living Wage. It’s the minimum hourly rate, not a weekly or monthly rate and it’s not a guideline but the law! As an employee, you want to receive your dues – that goes without saying and is in no way unreasonable. As an employer, you not only want to find, recruit and keep your ideal groom, you NEED to ensure you stay within the law regarding these minimum wages. A note on salary packages: Employees may need to declare to HMRC free products or services they receive as part of their salary package, including livery for a horse, the provision of a car and even accommodation. Employers may need to declare payments in the form of such additional extras. Why? Because the right amount of Income Tax and National Insurance must be paid for what the employee receives! Failing to do this can be interpreted as tax evasion and will land you in hot water! More information for employers can be found here. More information for employees can be found here. Many of us will remember when the Rt Hon Ed Balls came under fire for suggesting people should get a written receipt for all transactions, even small gardening jobs, even if it was just for £10 to cut a hedge because it was the “right thing to do”. As unpopular this suggestion may have been, he’s not entirely wrong, and this is certainly the case regarding permanent and temporary employment. Employers must provide employees with a payslip, before or on payday, and it must show the employees earnings before and after any deductions, and the amount of any deductions that may change each payday, e.g. Income Tax and National Insurance. The payslip can be paper or electronic (e.g. via email). If a groom is working on a self-employed basis the groom must provide their “boss” with invoices, and both parties need to keep copies of them. The groom must declare their salary and bonuses in their income tax self-assessment return. The National Minimum Wage and Living Wage rates still apply. If a groom works on a Freelance basis, invoices must still be provided and kept but in this case, the Freelance Groom will set the hourly rate of pay and by law, the National Minimum Wage and Living Wage do not apply. It’s boring, often difficult to absorb and understand, but it is imperative that you know your legal requirements and rights regarding the National Minimum Wage and Living Wage, and these will change fairly regularly – at least once a year. Here at Caroline Carter Recruitment, we will try to keep you updated via our Advice, Articles, and Blogs, but we will always recommend you consult an appropriate advisory body with questions and problems. ACAS offers invaluable services to both employers and employees, with free online tools alongside their helpline. Visit the ACAS website. The Government website contains a wealth of information regarding all things employment. Navigate your way around using the onscreen links on each page you visit. Visit the Government website. In addition to these, we will try to keep you informed of laws and legislation with a slant on the equestrian industry. You can see all of our articles here. If you are an employer in the equine industry it really is worthwhile joining the Equestrian Employers Association. EEA members range from private family yards through to large riding schools and Olympic medallists – all of whom employ grooms. Membership benefits include access to the Contract Creator, discounted Pension and Payroll services, free legal helpline and bespoke downloads for managing your team. If you are workings as a groom then the British Grooms Association is for you. The British Grooms Association is the professional body for people who work with horses, offering a unique membership to all grooms who work in the UK and British grooms who work abroad. As a member, you’ll receive dedicated support, career advice and a range of membership benefits. It is something the team at Caroline Carter Recruitment will say again and again – don’t be afraid to discuss wages/salary packages/money. Caroline has written an interesting article for both employers and employees about broaching and discussing the subject of salary here, and it’s well worth having a read of it. After all, grooms work for a living, and employers want to keep good grooms! Taking a job, or taking a new employee into your fold is a big move and it only works if it not just starts out right but remains right, and that needs regular review and adjustment. Let’s make this April the perfect time to attend to this.